Building your online presence with the right tools and processes is a complex task. With your ideal blueprint in hand it's time to build your online presence. But there's a whole bunch of sub-contractors and project management someone has to supervise. So that's where we come in. The tech you need is the one that meets the Functional Requirements your process involves. Knowing requirements and systems already in place helps us choose between custom code and off-the-shelf solutions. High-quality, authoritative citations are viewed by experts as the #1 ranking factor in competitive local search markets. We'll get you ready and going in general and specialty directories. New ideas means new graphics. If you're re-branding the entire company, or just need help with campaigns, we've got a independent partners that we've already vetted. Take advantage of our network of creative experts. Better control of development projects means faster implementation, lower cost, and fewer mistakes. But it takes a lot of work! We'll choose the Developer that knows your tech and manage projects for you. For context, the Lab uses a 165 point checklist when refreshing or re-platforming an ecommerce of lead-generation website. 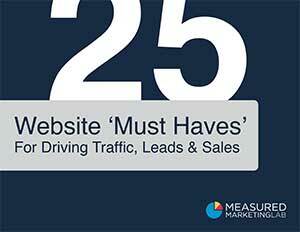 Learn these core 25 considerations or use this as a checklist to double check your website’s condition. "We used to have to buy our traffic from AdWords. The Lab helped us get better quality traffic from our own content, and save $6,000 every year."